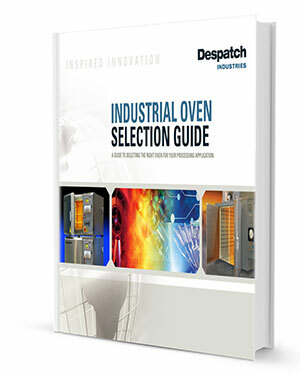 Despatch Industries, with a long held reputation for high quality industrial ovens and furnaces, announces that it is reducing lead times on some of its most popular ovens. The move is the result of an extensive effort to eliminate non-value added variations while standardizing popular options. Customers have increasingly confirmed that lead time is a significant factor when deciding what oven to purchase. Despatch had already reduced lead times to just three days on standard laboratory ovens. This was accomplished by restructuring its manufacturing processes to allow for in-lining of production equipment and assembly stations that improved flow and minimize production time. With less variation in the product line and manufacturing process, Despatch is able to reduce lead times to just three weeks on two of its popular laboratory cleanroom ovens, 20 and 25 cubic foot cabinet ovens and 52, 104 and 216 cubic foot walk in ovens. The new 476 and 952 cubic foot walk in ovens will now ship within six weeks. Despatch manufactures a wide range of standard and custom industrial ovens designed to accommodate a variety of load sizes and production volumes. Standard production ovens include the LBB and LAC benchtop and laboratory ovens, LCC clean process ovens, RA series cabinet ovens, TA series walk-in and truck-in ovens and PTC top loading ovens.